That was my best shot at levitating so far. I was actually trying to take photos of a sweater I crocheted (in one piece in a sideways manner, I’m hoping to post the pattern soon). 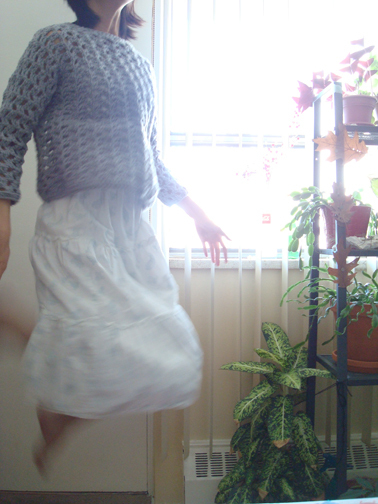 The way I positioned the camera was too low and couldn’t capture the entire skirt, so I decided to take a jumping shot, inspired by Natsumi Hayashi’s levitating self‐portraits. Having been following Natsumi’s posts for a couple of years, I’ve found that the key to levitation (as opposed to just jumping) in a photo shoot is that one has to jump while relaxing one’s shoulders and arms. It’s actually quite difficult. A lot of controlled coordination needs to happen in a fraction of a second. In this photo I certainly still looked like I was jumping, but I like the way my arm and hand look in the light. I’ve been stressed on many fronts lately. The paradox of jumping — a surge of energy to propel oneself off the ground against gravity — while being relaxed was actually quite enlightening when I thought about my recent encounters with conflict. What this makes me realize is that, in conflict, I have to learn to sustain a clear and calm state of mind in the face of heightened emotions. Heightened emotions that threatens to derail my thoughts and actions. Realizing that it’s difficult, and fearing that it might be impossible for me to ever do well, I find this poem comforting. May we all find clarity and compassion today.